If you've not used my.viewranger.com yet, it would certainly be worth reading this quick introduction to its main features! 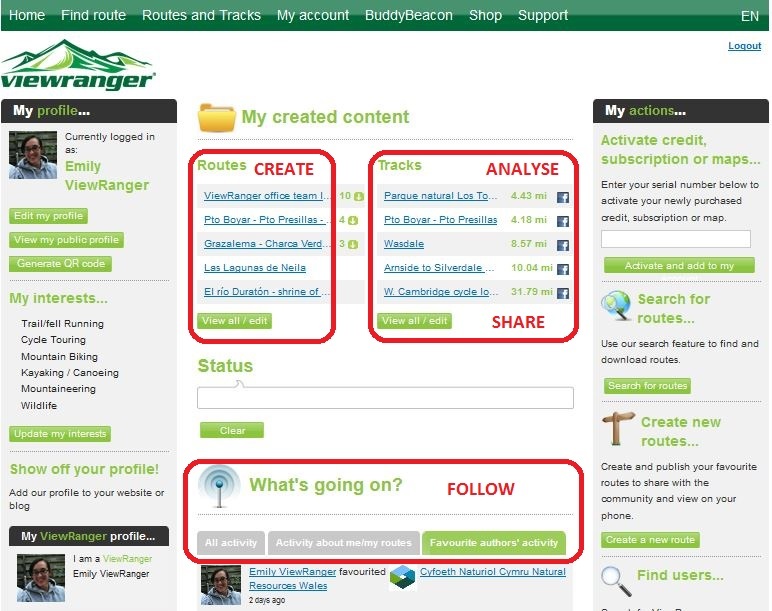 My.viewranger is a useful tool to browse and manage your ViewRanger content and favourite route publishers on a bigger screen. Synchonising your my.viewranger.com account with your app couldn't be simpler - you just press the synchronise button on the app. CREATE – you can create a route from scratch, create a route from a GPX file, or from a previously recorded ViewRanger track. As well as plotting the route on a map, you can add photos and route information to waypoints, making it a truly complete route guide. For the moment, publishing routes is only thing you can do on my.viewranger that you can't do on the app. This element is the backbone of the ViewRanger Community. If you have a favourite walk or ride you think could be enjoyed by other people, why not publish it as a route and add it to the massive ViewRanger Community route library? ANALYSE – When you synchronise your app with your my.viewranger account, the tracks that you recorded will appear in the tracks section. You can re-name these either in-app or on my.vr as a way of creating a trip library. You can also view the different statistics from your outing and the photos/tweets taken at the time (if you've linked your Flickr or Twitter and your ViewRanger accounts). FOLLOW – On the lower half of the my.viewranger homepage, the 'What's going on?' section allows you to see what your friends and favourite route publishers have been up to, where they've been, and what new routes they have published. The 'All activity' feed allows you to see what's going on in the ViewRanger Community. All tracks created and routes published all over the world appear here in real time, so you can get a good idea of what everyone is up to and maybe get inspired! PROFILE – It is not compulsory to complete your ViewRanger profile, but it is nice to learn more about ViewRanger users. Other VR users will be able to see your public profile, and your contacts will be able to also see your sporting interests. In the near future we would like to do more sport-specific communications, and completing this information would help. And there you go, My.viewranger in a nutshell. Take a look, we're sure you'll like it! For some more tips on getting started with My.ViewRanger click here. And for a Beginner's Guide to everything ViewRanger, please visit our wiki.